As for the original post which started this; my guess is that few '03 bayonets served with the Army on the Western Front. Well you can hardly blame members for providing evidence either way (especially on this forum) - you did say it was a "guess". Anyway I reckon there might be a few Engineers more than a little disgruntled to hear that they don't rate as "front-line" troops.! BTW Chris, how can you tell that your ASC man has a P1903.? Couldn't it just as easily be a P1888 in its scabbard, and the rifle a prop.? I have looked hard but am still unsure what it is. I just thought that it looks like a posed photograph, so perhaps the rifle could be a ring-in.? I was curious about your photo, so tried to do some more analysis of it on my own. As you know, the only difference between the P'88 and P'03 is in the pommel. From the bottom view of the pommel, the P1888 bayonet has a large slot where it attaches to the rifle, whereas the P1903 has a solid 'beak-shaped' protrusion. I have had a go at manipulating the image and it appears to me that there might be a slot showing at that point. You might do better with scans of the original.??? 1. The Locket on the Indian scabbard will typically have 3 rivets set in a pyramid design, which is not seen on the British Pattern 1903 Bayonet scabbards, be they internal chape, external chape or British re-furbished scabbards. 2. 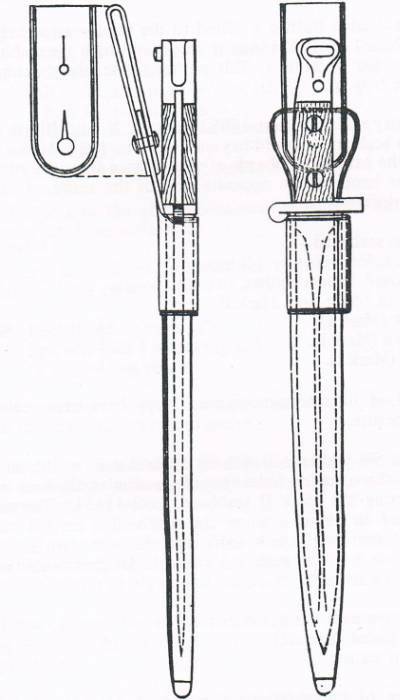 The Chape on the modern Indian scabbards is cut very straight at the top, and the scabbard fittings are usually factory painted. Thanks LF - isn't the frog stud also the wrong shape? I just remembered that Dean posted some very good photos of his damaged scabbard in this thread HERE that would make a perfect example. 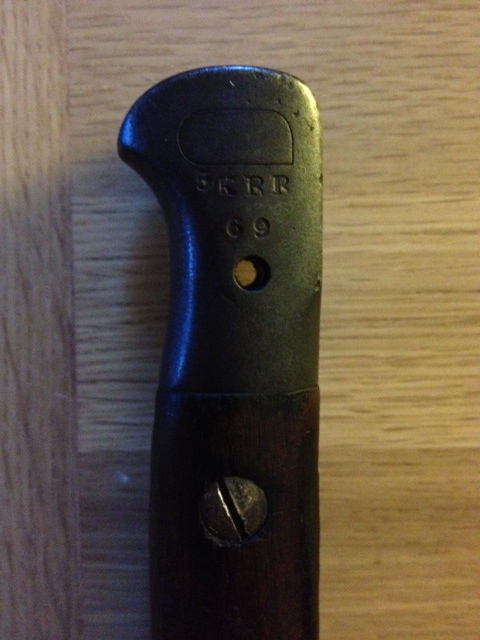 As you can see from the photos it is an original British P1903 scabbard because it is Broad Arrow marked, Birmingham inspected and dated '03.? 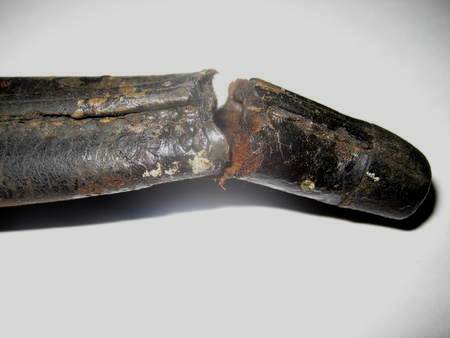 The second photo shows the internal chape which 'plugged' the bottom tip of the leather scabbard, and also the type of damage which can occur. In cases where this damage needed repair they would install the external chape of the P'07 type in its place in accordance with LOC para #14866. While the chape may have been replaced, the rest of the scabbard remained unchanged and would still have all the British inspection markings etc. You would expect ALL period scabbards (even those produced in India) to have all the regular markings in place (and dates) even after any repair. EDIT. Upon closer inspection Dean's scabbard is actually a better example for discussion than I first thought - especially if you look closely at the tip. 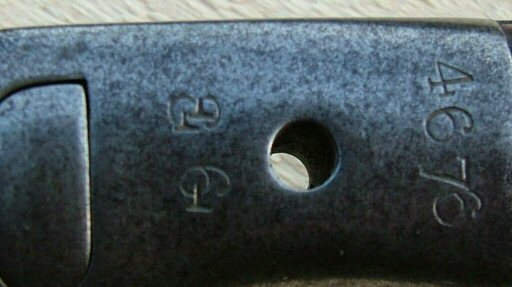 This is an example of the earlier 'plug type' internal chape which was found on the P1888 Mk.II Land scabbards - the P'03 being much less prominent. So that means even though it is dated with the '03 and was found together with a P1903 bayonet, it is actually a P1888 Mk.II Land version made in '03.!! The fact that it is without its slide-on frog does make it more difficult to identify ... but there it is ... so never make assumptions & always look to the clues. It seems some P1903s at least were issued to ASC motorized units (I assume their shorter length meant they were less awkward) here is an example of one in use, with P1903 belt and ammunition pouches - from a wartime picture. I have been busy with other things, and only today saw your excellent period photograph of the Pattern 1903 Bayonet in use. 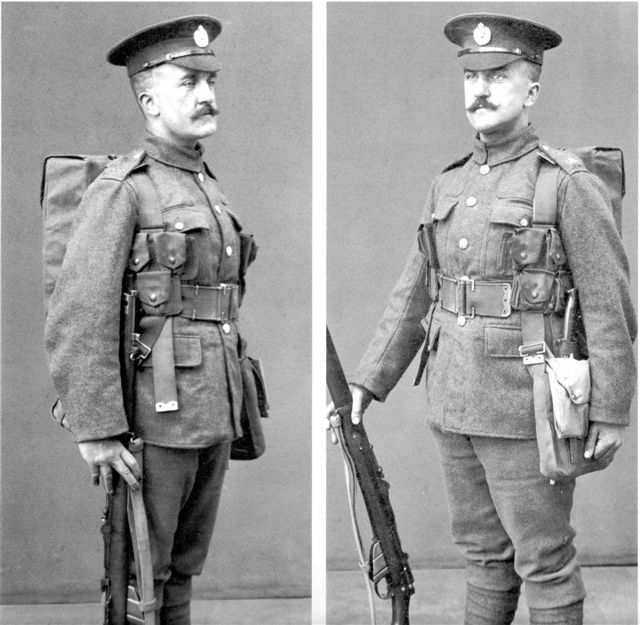 I found another period photograph in Stephen Chambers' excellent book on British WW1 uniforms, which shows the Pattern 1903 Bayonet being worn with the 1908 webbing equipment, and the SMLE rifle. 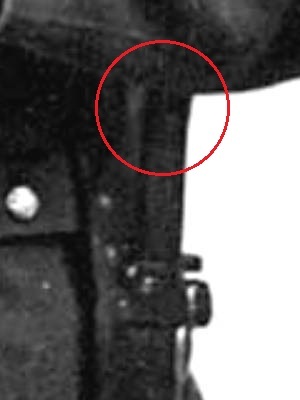 The Pattern 1903 Bayonet scabbard is attached to a webbing frog, and appears to have a frog stud, also where the scabbard protrudes just below the webbing shoulder satchel, you can see the tip of a metal chape. That is because it is a P1888 Mk.I Land scabbard, just like the scabbard that is shown in Chris's photo ... probably the most common scabbard that P1903 bayonets were issued with. Because the P'88 and P'03 bayonets were exactly the same length with same blade profile, the scabbards were actually interchangeable. But still they were separate Pattern scabbards. With all this chat about 03 bayonets, a subject of which I know very little. I hope you will be interested in mine. I hope you know that now you've posted it you will have to follow through with more descriptions and closeup photos of the markings that are found on it.! You see it is another perfect example for discussion on this thread ... and of course it is not JUST a P1903 ... and that scabbard is again of much interest. And the scabbard appears to be another P1888 Mk.II Land version like the one shown above (again missing its slide-on frog) .. it does look in nice condition. Do me a favour will you, and scour the back of that scabbard along the seam and see if you can make out any markings. Also anything else on the bayonet.? I have had a try at photographing the details that you mention. The pommel has been let and brazed onto the shaft of the blade. The struck out number on the pommel is 86, which is interesting as the scabbard has 85 stamped on it. So with the hope this works here are the pics. 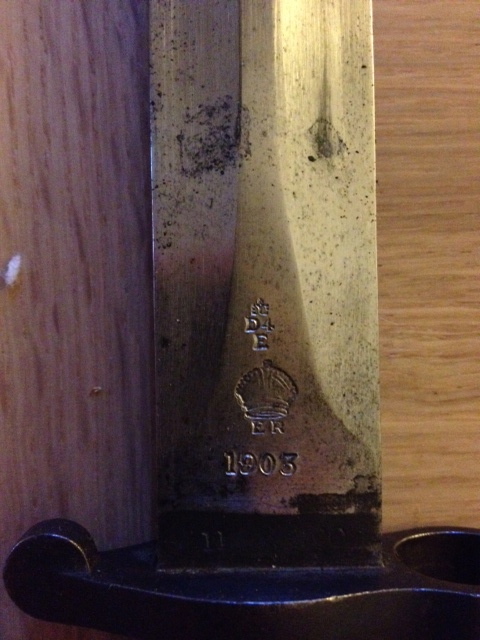 You appear to have a Pattern 1888 Bayonet made by Wilkinson, converted to a Pattern 1903, and the stamping on the blade ricasso just below the Pattern 1903 stamp is not clear, but is probably the original Pattern 1888 issue date of 8 92 ( August 1892 ) or 8 02 ( August 1902 ). 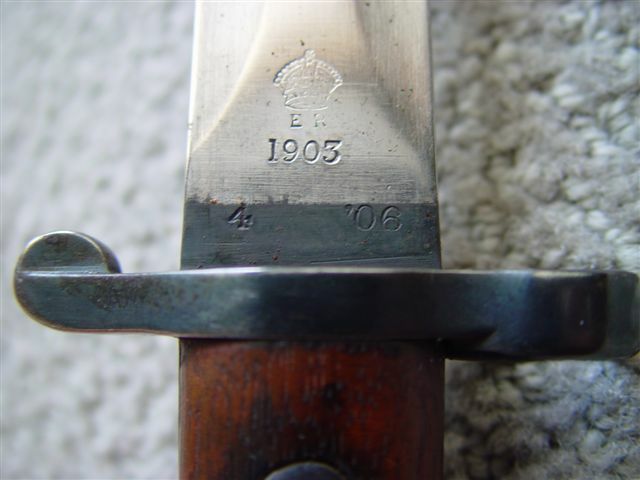 The Enfield scabbard has the War Department Broad Arrow impressed mark, with the Enfield mark ( EFD ), inspection marks, and the scabbard production date, which looks like either 03 ( 1903 ) or 05 ( 1905 ). Thank you for that. I am tempted to put up some pictures of my 88 pat, although the blade is a little sad the pommel is stamped OTC HAR 187, which I have always thought indicated it came from Harrow School, but I don't want to hog the limelight too much. 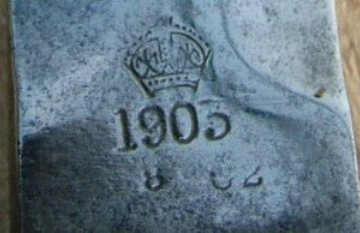 Please post a photograph of the Pattern 1888, and yes the pommel stamp ' OTC HAR ' is for the Officer Training Corps - Harrow School. Excellent photos of the markings Gareth, so thanks for posting. Your bayonet is certainly an Indian conversion done at Ishapore, showing the overstamped cypher. I suspect it has been through a couple of reworks in India, with the original markings partially scrubbed, the later inspection marks applied, and some replacement grips. 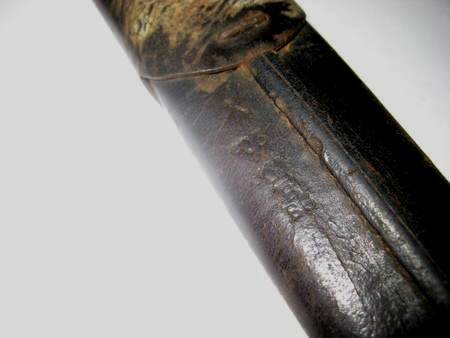 Your scabbard is an original British issue and remains in far too nice a condition to have been with the bayonet in India - do you have any further provenance on the set.? Sorry I have no further info on the bayonet, it was sold to me by a friend at a very reasonable price to go with my 1903 bandolier equipment set. He thought the absence of a metal chape at the bottom of the scabbard indicated it might have been for Volunteers, but was I assume he was mistaken. I will take a couple of photos of the 1888 tomorrow, and find the thread about them or start a new one if I can't. He thought the absence of a metal chape at the bottom of the scabbard indicated it might have been for Volunteers, but was I assume he was mistaken. But yours is missing the original leather frog/hanger - I actually suspect that these frogs were all replaced with the P1903 type during the conversions. Just to follow up on the excellent information from shippingsteel, the Royal Crown on Indian blades, sometimes known as the Ishapore Crown, is a very distinct design, and a somewhat cruder design than that of the the King's Crown found on British blades. ... the Royal Crown on Indian blades, sometimes known as the Ishapore Crown, is a very distinct design, and a somewhat cruder design than that of the the King's Crown found on British blades. Technically the P1888 bayonets that were converted in India are all British blades that were originally made in Britain. To my knowledge no P1903 bayonets were made in India. Most would have previously born the crown of Queen Victoria, some later ones the crown of King Edward and even a few 'Volunteer' pattern types would have had no crown at all. 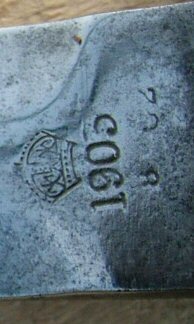 That Indian style crown is an overstamp after much of the previous markings have been scrubbed off. I'm not that certain of the period but there is evidence that dates it to the '30s. You are absolutely correct, and I did not mean to imply that the 1888 blades were made in India, but rather that after they had undergone conversion at Ishapore and the Ishapore Crown had been applied to the blade, that blade effectively became, as you say, an " Indian Conversion ". 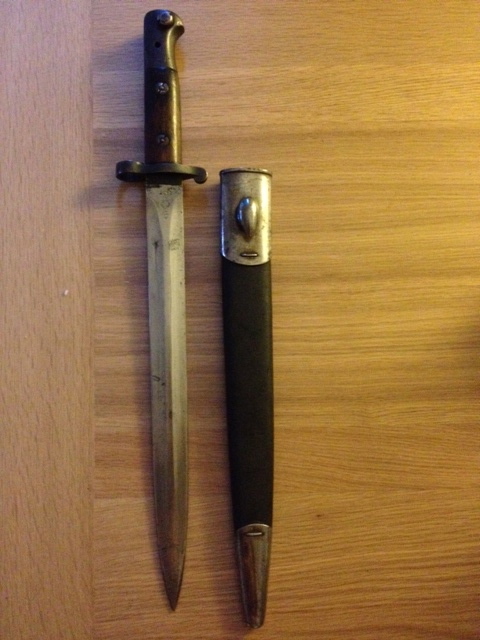 Finally, a year on from my original post, I've managed to find a 1903 bayonet to add to my collection. As far as I can tell the bayonet is in its original finish (blued pommel and ricasso and bright blade) and in very nice condition. It was advertised as a "Metford bayonet" and much cheaper than what I normally see so I was glad to step in and give it a good home. I believe the scabbard is a MK1 P1888 scabbard. 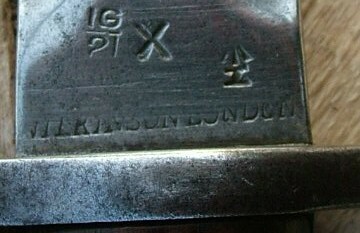 The bayonet also has very nice regimental markings to the 5th Kings Royal Rifle Corps. 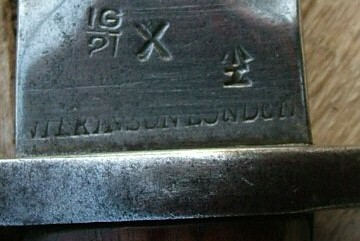 Anyway please do let me know what you think - the date is 11 '0?, and there are some larger numbers on the reverse of the pommel (post war Indian/ Home guard? ), no manufacturers marks, clear bend mark but no government acceptance mark, and an "I" marked to the edge side of the ricasso. Plus the "5KRR" regimental markings... Any thoughts? 5th Battalion Kings Royal Rifles, so your bayonet is officially a "sword", as Rifle regiments call all bayonets "swords" regardless of size shape or length. Hi J, that's a very nice looking P1903 bayonet you have there, so well worth the wait I should think, you've done very well I believe. It looks to me like it was originally a P'88 that was converted to P1903 form. Possibly from a 'Volunteer' blade which wasn't accepted. The inspection mark above the cypher is usually found on converted examples, but a look at the other ricasso would be useful here.? And the bluing does look in excellent condition. I would probably be checking that black stain on the ricasso looking for any black paint. It is very well marked with nicely stamped regimentals which is good. And of course the scabbard is the commonly found P1888 issue. And the official term for these bayonets has always been "Sword-Bayonet, Pattern 1903" so the Rifle regiments were very much correct.